Fixed an issue where no animations were shown. Don't just see the temperature, FEEL the weather! 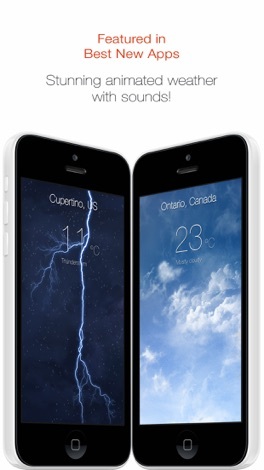 Experience weather in a gorgeous, beautifully animated, real-like scenes. Hear the rain. Hear & witness the thunderstorm lightning strike. Be there in the sky with beautifully animated clouds and experience the clear night with cricket sounds. Its like your iPhone/iPad is a window into the real sky. ***** Featured by Apple in Best New Apps. 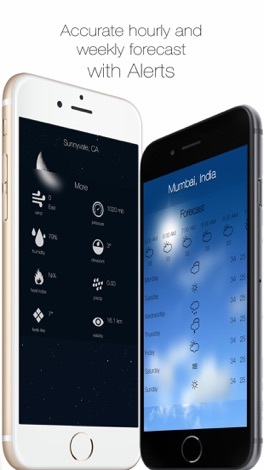 The most beautiful weather app on the iPhone and iPad. 1. Receive important weather alerts (US only). 2. 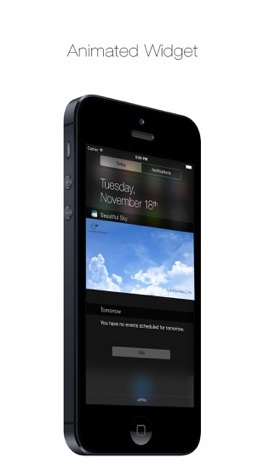 Fully animated weather widget for Notification Center. (First time on App Store.). 3. Available in 7 languages. 4. Add & view multiple cities' weather data. 5. View hourly forecast for any city. 6. View weekly forecast for any city. 7. Tons of detailed information available. 8. View pressure, wind speed, wind direction, humidity, precip, heat index, visibility, max/min temperature, dewpoint etc. 9. View temperature in celsius/fahrenheit. 10. Different scenes for different weather conditions. 12. Fully animated weather scenes. 13. Realistic sounds in select scenes. 14. Rotate your iPhone to view all added cities together. 15. Totally gesture based navigation. 16. Add/Remove dummy cities for viewing different weather conditions. 17. Auto determine your location based weather data (on first launch). 20. No ads or in-app purchases. For the first time on App Store, view your current location's weather quickly on Notification Center in a lightweight and beautifully animated widget. We think you will love it. 1. Beautiful, real like weather visuals. 4. Tilt your iPhone to experience visual parallax. 5. Realistic rain and snow. We have worked extremely hard for this release. Hope you will love it. We have a lot more planned for the next updates. For any issues/help, send us an email via app. Please share it with your friends and rate us in the App Store. That encourages us a lot. Also check out our award winning keyboard app: ReBoard Keyboard.